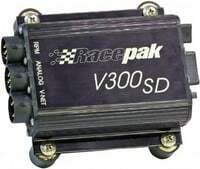 Racepak's Intelli-Gauges are a great support component of the Vnet data recording system. Available in either black or white, their unique capabilities and ease of installation make them attractive for a wide variety of uses. All gauges are 2 5/8" diameter (hole size), feature a 270° sweep hand dial, a programmable digital display and electro-luminescent lighting. The purchase of a single gauge includes the Gauge T Cable. Determine the distance from the gauge to the AUX to Vnet cable and then select the appropriate length T cable with your gauge. The purchase of multiple gauges requires the use of Gauge to Gauge cables to connect each gauge to the adjacent gauge, while the last gauge in line requires a Gauge T cable. Determine the distance between the each gauge and select the appropriate length Gauge to Gauge cable or cables with your gauge. Determine the distance from the last gauge to the AUX to Vnet cable and select the appropriate length T cable with your gauge.